The Memorial Hunters Club is crowd-sourcing a national registry of WWI memorials and based on our results since our launch in October, we have come up with a credible number. There are 3,500 WW1 Memorials in the US and 2/3 of them have gone missing! The US World War One Commission has a state publishing partner program where we host state WWI commissions on our national website. Those teams have access to the same mapping function we are using for the Memorial Hunters Map - In fact they can post memorials on their state maps and punch those through to the national Memorial Register map also. Three of those states have really rocked it with great efforts to ID and post their state memorials. Those states are New Jersey, Georgia and Alabama. As three eastern and south eastern states - they average 118 WWI Memorials per state. There are 26 states East of the Mississippi, so we will assume that they are average based on our reference states. There leaves 24 states West of the Mississippi. We will assume that they are at 50% of average in those states. Though Hawaii has a WWI memorial, a WWI Centennial Committee and they publish on our site - to be conservative, we will eliminate Hawaii and Alaska from our count. Based on the memorials we have identified and registered, we only know about 30% of them or less. So help get the word out about the Memorial Hunters Club. Help us find, register and catalogue this American archeological treasure that is hiding in plain sight! 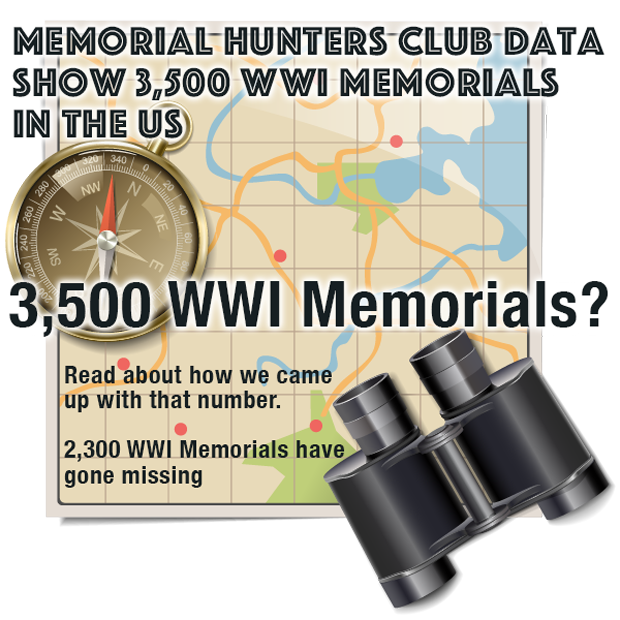 Go to ww1cc.org/hunter and help us ID and register the missing 2,300 Memorials! Mid Western WW1 memorials currently identified and registered.